Medical anthropometry is the collection of precise, reproducible surface measurements of the human body. The late Leslie Farkas was a medical anthropologist who accumulated large numbers of facial surface measurements – including landmarks, size and inclination of features – of various population groups of both sexes. These data defined normal – or average – values, as well as gender and ethnic differences in facial measurements and proportions. In my North American practice, I have used his measurements made in a large group of young North American Caucasian adult men and women in planning facial aesthetic surgery. These measurements provide an atlas of what biologically – and, in turn, culturally – define youthful appearance. For example, it is important to know the average shape and dimensions of a young women’s eyelids before performing aesthetic blepharoplasty on a woman concerned about the aged appearance of her eyes. Similarly, knowing the average height and shape of the youthful brow helps in performing browlift surgery, ear shape and position before otoplasty, etc. The use of these normal facial relations have been invaluable to me in guiding me to an aesthetic goal for my surgery. Anthropometric data also help identify the differences between men’s and women’s faces (known as sexual dimorphism). On the average, all facial measurements are greater in men than in women. In addition, the relations between measurements differ in men and women. These differences are pronounced in the lower third of the face. The bigonial distance, (the distance between mandible angles) is the transverse facial dimension that has the greatest difference between the sexes. In other words, the lower one-third of women’s faces tends to be absolutely and relatively narrower than that of men. These typical differences is shape and proportion inform our perception of ‘masculine’ and ‘feminine’ facial features so gender-related differences have implications for surgical planning. For example, if a normal dimensioned male mandible is augmented in the transverse dimension, it may be perceived as stronger. However, if a normal dimensioned female mandible is augmented, it may be perceived as looking masculine. The small dimensions and complex configuration of the human face make millimeter differences and changes noticeable and significant. 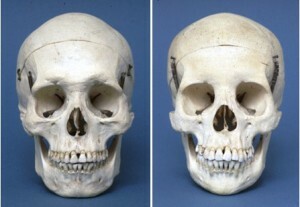 The images below provided by the Atkinson Skull Collection, University of the Pacific School of Dentistry, Webster Street, San Francisco, California show a typical make skull on the left and a female skull on the right. Note the difference in scale and particularly, the size and shape of the lower jaw which will ultimately determine the appearance of one’s chin or posterior mandible. Anthropometric data is an important tool in understanding a patient’s facial structure and proportions and mapping how augmentation of different aspects of the face will influence surgical outcomes. The framework it provides lets us better define the goals of surgery and determine how to achieve the patient’s aesthetic ideal.